Most often when we hear the word “outfit”, we think of the clothes: a top, a skirt, shoes or maybe even a jacket. While clothing plays a huge role in a perfect outfit, accessories hold an equal importance to set own stylish trademark. One of the best ways of having a good collection of accessories is that you are always able to dress the way you want without spending a lot of time and consideration into it. One such accessory that can easily make a woman from average to fashionable is clutch bags. Nothing seems to be more glamorous than a clutch bag as it is designed that fits in the hand perfectly whether you are dancing, socializing or grabbing a couple of drinks. Never underestimate the importance of quality: A good quality clutch bag is always an investment. Make sure the one you buy is fully functional and versatile to accommodate financial paraphernalia including cash, credit and debit cards, ATM cards and checkbooks. Go for an appropriate color: Generally, color of the clutch bags depend upon the whole outfit. Black and neutrals have always work wonders for anybody. However, occasion plays a very important role when it comes to selecting a clutch. 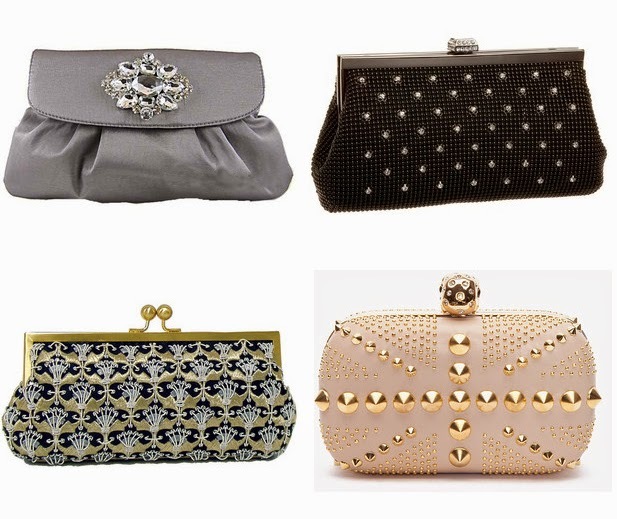 Go for a small bejeweled clutch; if you are going for any party while for an official event always keep it sober. Pick the perfect size and shape: No doubt clutch bags comes in variety of shapes and sizes, it is essential to choose the proper shape and size of the bag. If you are a petite woman, a large bag may overlook your personality, whilst it emphasizes some of the large body parts to a plus size woman. Consider the occasion: Basically, there are three types of clutch bags available evening clutch bags, designer clutch bags and beaded clutch bags. Evening clutch bags are meant to be worn for formal dinner or special occasions. They are available in a wide range of styles and can be hanged around the shoulder with chains or straps. Beaded clutch bags are personalized items that make the best style statement of an individual. Such bags reflect the personality of the user and are perfect for different occasions and functions. Embellishments: Clutches in luxurious fabrics like Satin, Velvet, Raw, and Brocade always prove ideal for festivals. You can also decorate it with gemstones, lace, bows, metal, chain, etc. If you want to put a vintage effect, attaching brass filigree will get you a great look. You can easily buy filigree from a craft store and then paint it with antique solution. If you are a fashion conscious, designer clutch bags are mass-produced by using high quality materials along with attractive designs, unique styles and finishes. These bags designed to suit women of all ages and have great capacity to store all the valuable items. Properly accessorizing is one of the key elements to complete your overall look. So before the seal the deal make sure that the clutch you choose is something you find attractive and compliments your own style. The above article has been written for Apparel Search by a guest author. Author bio: This post has been authored by Daniel Clark. He is a feminine fashion expert and provides extensive ideas upon various fashionable aspects and accessories including clutch bags which suit to the style statement of women’s fashion. Thank you for taking the time to read this blog post. We hope that you have found these shopping tips to be informative. If you have comments or questions, please add your thoughts in the discussion area below.